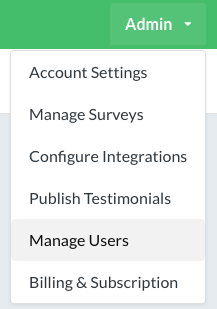 To manage users in your Simplesat account, head over to Admin > Manage Users. Find the user you'd like to edit and open the dropdown menu. Choosing Edit allows you to change a user's permissions. To delete (remove), click Delete and confirm.